First comes love, then comes marriage, then comes your wife’s possession by something rather insidious during your honeymoon at a secluded cabin in the woods. Romantic, right? 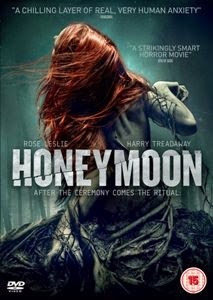 Honeymoon (2014) is a lo-fi horror flick that builds on its familiar narrative setting, opting for simmering mystery and big jolts instead of slowly building tension. Newlyweds Bea (Rose Leslie) and Paul (Harry Treadaway) make the long journey from Brooklyn to the Canadian wilderness to spend their honeymoon at Bea’s family cabin. After a few days of fishing, cooking and marital consummation, a disconcerting reunion with Will (Ben Huber), an old friend of Bea’s, leads to her disturbing night-time disappearance. When she returns to the cabin, Paul begins to notice a shift for the odd in his beau’s personality. She forgets how to make coffee, mixes up commonplace words, and seems to recoil at his touch. As he tries to figure out what happened to Bea that night in the woods, the safety of this young couple becomes more and more tenuous. As a first-time outing in directing and writing, Leigh Janiak fares rather well. The offer of a simple and disconcerting horror picture is one generally well-received, but the director’s major failing is failing to present a creature or entity worthy of being scared of. The hope of smoke-and-mirroring the audience into fear just does not work; modern viewers demand a bit more. There simply aren’t enough unsettling clues or genuine scares to make the horror truly felt. The majority of the runtime is taken up trying to fathom who – or what – Bea is after her wander through the woods and it plays like a hipster pastiche of Invasion of the Body Snatchers (1956). Mystery turns to abject horror in the final act, full of blood and tears as Paul begs Bea to tell him what truly happened and Bea desperately tries to find an appropriate explanation. The best and bloodiest reveal involves one of the most disturbing acts of female genital mutilation since Teeth (2007) and it raises the question of why Janiak didn’t inject a little more gore in beforehand? Both Leslie and Treadaway don decent American accents and do the best they can with some awful lines – “after last night you deserve to relax, to rest your womb.” Their performances leave a little to be desired by the bare-minimum in chemistry; both have definitely given better in the past and that may be down to Janiak’s direction this time around. While the ends justify the means, Honeymoon fails to provide any real insight into, or fear of, the plight of Bea and Paul. By the time the credits roll, you may be left wondering why you pressed ‘play’ in the first place.